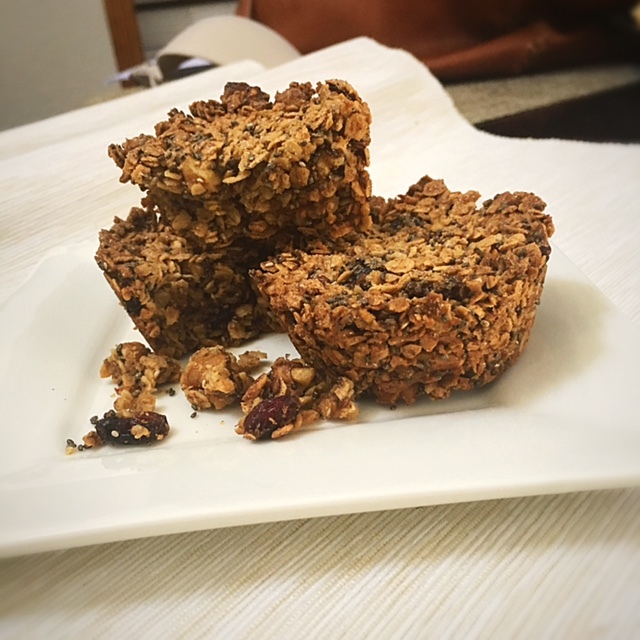 Take the average person’s’ top 2 breakfast options and combine them together to get this Low FODMAP Granola Muffin! Basically, you’ll make delicious homemade granola and bake it in a muffin tin so that you end up with 12 individual portions of this one-the-go treat. Each muffins contains 215 calories, 9 grams of fat (primarily from omega 3s), 30 grams of carbohydrate, 4 grams of fiber and 4.5 grams of protein. Grab one of these muffins with a plain Greek yogurt and you’re out the door in no time with a satisfying and nutritious breakfast. You can also have one of these muffins as an afternoon pick-me-up or a pre-gym snack. This recipe is low FODMAP, gluten free, dairy free, and vegan/vegetarian. For nut allergies, replace the walnuts/pecans with equal parts sunflower or pumpkin seeds. Mix together the dry ingredients including oats, flaxseeds, chia seeds, walnuts, and craisins. In a separate bowl, mix together the wet ingredients including the oil, syrup, sugar, vanilla, cinnamon, and salt. Pour the wet ingredients over the dry ingredients and mix until well combined. Spoon ~1/4 cup of the mixture into each muffin tin and press the mixture down with a spoon. Bake for 27 to 30 minutes, or until the top of the muffins appear golden brown. Allow the muffins to cool before removing them.